* Heavy duty full metal construction with commercially designed for: Medical & Military systems, Media servers, and IPCs, approved & used by Tier 1 companies. * Perfect for rugged applications and complies to flammability requirements. 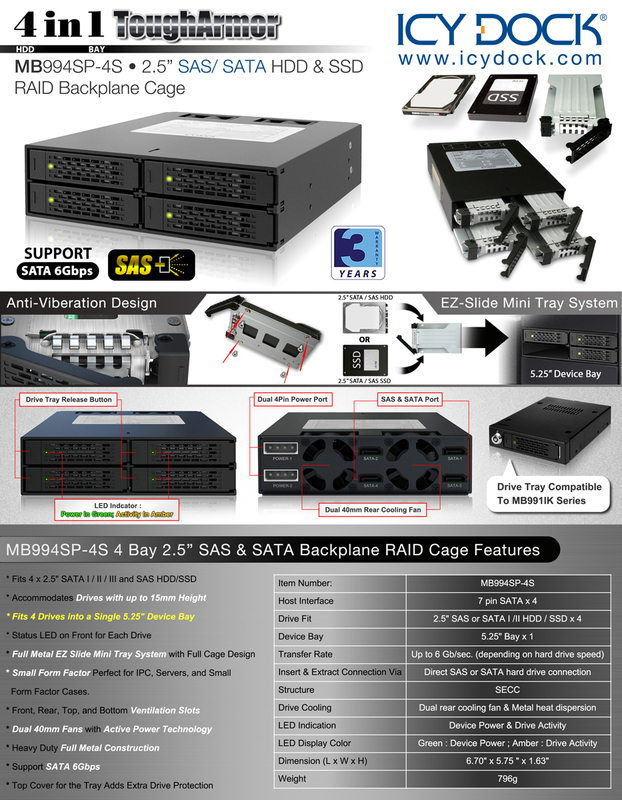 * Fits 4 x 2.5" SATA I / II / III and SAS HDD/SSD. * Accommodates 2.5 Drives with 7mm, 9mm, 12.5mm & 15mm Height. * Fits 4 Drives into a Single 5.25" Device Bay. * Status LED on Front for Each Drive. * Full Metal EZ Slide Mini Tray System with Full Cage Design. * Small Form Factor Perfect for IPC, Servers, and Small Form Factor Cases. * Dual 40mm Cooling Fans. * Heavy Duty Full Metal Construction. * Top Cover for the Tray Adds Extra Drive Protection.